2016 Alfa Romeo Giulietta 1.6 JDTm review | What Car? Six years after its launch, the Giulietta five-door hatchback has just been facelifted for the second time. Cosmetic changes are scarce, but look closely at the car’s nose and you’ll see a new grille with a black honeycomb finish, new black bumper inserts and slightly altered light surrounds. There have been wholesale changes to the trim range, though, which now consists of five specifications: entry-level Giulietta, Super, Tecnica, Speciale and Veloce. Lastly, the option of an automatic gearbox has been made available on the low-emissions 1.6 diesel in an attempt to court company car drivers. That’s the model we test here. What’s the 2016 Alfa Romeo Giulietta like to drive? Although it’s the slowest Giulietta, the 118bhp 1.6 JTDm still feels nippy. It pulls cleanly from low revs and offers a decent amount of shove between 2000rpm and 4000rpm. There’s not much turbo lag, either. It’s a fairly refined engine, too: quiet at idle and smooth throughout, and although it becomes quite loud at high revs, it's never harsh. The automatic gearbox - expected to add about £1500 to the price when the car goes on sale on April 1 - is a good match for the engine. It slips quietly from one gear to the next, and also shifts smartly when you use the steering wheel-mounted paddles during faster driving. For maximum performance from the engine and gearbox you need to set the ‘DNA’ drive mode selector to ‘Dynamic’. This also adds weight to the steering, which is responsive and accurate but can feel quite lifeless. 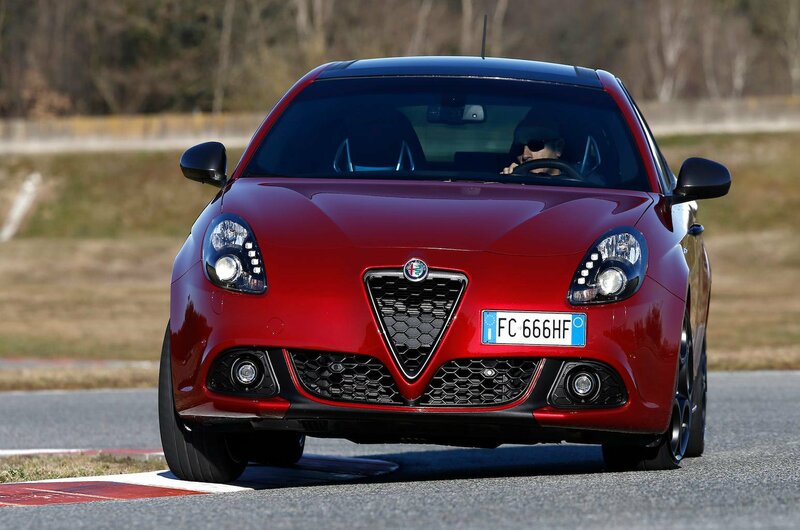 The ride is focused more on comfort than handling (especially on the entry-level 16in alloy wheels), which doesn’t tally with Alfa’s sporting image but will please long-distance drivers. Road noise is too prevalent, though. What’s the 2016 Alfa Romeo Giulietta like inside? There’s a smattering of new cabin finishes on the dashboard and doors, but the interior is largely unchanged. That’s not bad news, though, because it’s stylish and, for the most part, well finished. Soft-touch finishes run beyond the obligatory dash-top, and the variety of materials and shades lift the cabin nicely. The majority of switchgear is smart and feels solid, apart from the slightly cheap feeling rotary air-con controls. All Giuliettas now benefit from smartphone-based internet services, bringing the likes of streaming music, news, social media and traffic updates for sat-nav-equipped examples to the ‘Uconnect’ infotainment system - it uses a 5.0in screen as standard but can be upgraded to 6.5in. The system is fairly easy to use, but isn’t the most sophisticated and doesn’t react instantly to inputs. The driving position is good and offers sufficient manual adjustment, although the dial to adjust the angle of the backrest is tricky to reach, and the view from the rear-view mirror and door mirrors is less generous than in most rivals. A six-foot rear passenger behind a six-foot driver will have to splay their knees to get into position, while rear headroom is tight but bearable. The middle seat is even more limited in both respects. Boot space is poor for this class, losing out by some margin to the Audi A3 Sportback and VW Golf with the rear seatback up or down, and by a country mile compared to the class-leading Skoda Octavia. Alfas are often a choice of heart over head, but it needn't be the case with this Giulietta. It's both stylish and a bit different, and this engine and gearbox combination makes a compelling case on paper, especially for company car drivers. The classier Audi A3 Sportback 1.6 TDI SE auto offers identical economy and CO2 emissions, but costs more than £2000 more, while the equivalent auto Golf emits slightly more CO2 and is a similar amount more expensive. That said, both German rivals are also likely to hold on to more of their value. Ultimately, there are lots of things to like here, but poor scores for fun factor and practicality will be too important for some buyers to overlook.